A User with Parent: Child Access rights has Business Unit Access plus the ability to access objects or Records from any Business Unit that’s subordinate to the unit he is assigned to. If you think of an organizational chart for the divisions of your company, a deep view enables you to see your Business Unit and all those directly below it. Organizational Access rights should be reserved for a small group of system administrators who have the overall responsibility for the integrity of the database. At least two people in your company should have these rights (one for backup purposes), but probably not many more than that. It should not be a foregone conclusion that the CEO or the director of IT should have complete Organizational Access. With the privilege also comes the responsibility and the possibility of unintentional damage done by the weekend warrior or by those who view themselves as technogeeks. Individuals’ job requirements and their knowledge of the system relate directly to their getting this level of access. 1. From the Home Page, select Settings from the panel to the side of the main display. The Settings display with its seven subcategories appears. 2. Select Business Unit Settings from the Settings window and then select Security Roles. 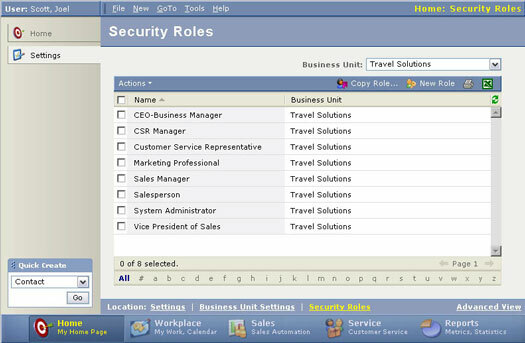 The Security Roles List View Grid (shown in Figure 1) appears, showing all existing roles. Figure 1: List view of all existing security roles. 3. View the sales manager’s role by clicking on his line in the List View Grid. 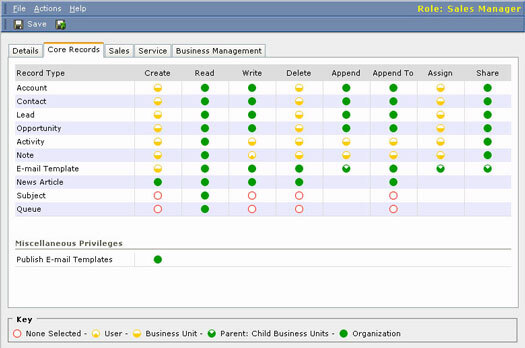 The Sales Manager’s Core Records tab, shown in Figure 2, appears with four other tabs along the top. The Details tab, which is the default, has very few details. The Core Records tab contains all the toggle switches to turn access rights on or off and is the central storehouse for role information. Figure 2: The sales manager’s rights regarding Core Records. 4. View the Core Records Tab and then click the rest of the tabs to see all the objects that can be accessed at various levels for the existing sales manager profile. 5. Click Save and Close from the blue Actions Bar to return to the List View Grid. 2. Select Business Unit Settings and then select Security Roles. The Security Roles List View Grid appears. 3. Click the Copy Role button from the blue Actions Bar. 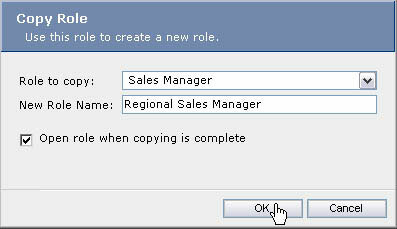 The Copy Role dialog box, shown in Figure 3, appears, asking which original role you want to copy and what new name you want to use. Figure 3: Copying a new role from an existing one. 4. Select the role you want to copy from the drop-down list in the Role to Copy field. In the blank New Role Name field, type a new and unique name for the new custom role. 5. Check the Open Role When Copying Is Complete box. This immediately brings up the window for the new role with all the settings from the original role. If, by some chance, the Core Records window does not appear, select that tab to display all the role settings. Toggle any of the settings to change them for the new role you are creating. You can continue to toggle each setting to go through each of the five possibilities. Make sure to review each of the five tabs: Details, Core Records, Sales, Service, and Business Management. 6. Click Save and Close after you’ve completely tailored the new role. A User can have more than one assigned role. Someone could have a role as a systems administrator and as a mailroom clerk. When a single User has multiple roles with different privileges and access rights, the role with the less restrictive privileges takes precedence. So, even when your systems administrator is functioning as a mailroom clerk, she will have the maximum levels of access rights.